Fulani people are threatening me over anti-grazing law – Ortom – Royal Times of Nigeria. Governor Samuel Ortom of Benue state has said some unidentified Fulani persons are threatening him over the anti-open grazing law recently enacted in the state. 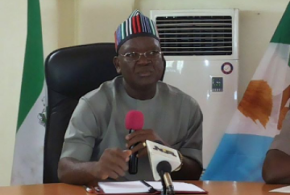 Ortom stated this on Wednesday while addressing members of National Council of Tiv Youths who were protesting utterances by Fulani leaders against Tiv people. The governor said he would not rescind his decision while stating that the law would commence latest November 2017. It could be recalled Ortom had signed into law a bill prohibiting open grazing of cattle and livestock in the state. The law had among others provided that anyone who engages in open grazing in Benue State and on conviction will now be liable to five years imprisonment and provided for monetary compensation in case of any damage to a property and imprisonment of two years of the livestock owner or manager in case of injury to any person in the state. He said; “Just this morning (Wednesday) one Fulani called my wife and asked her to warn me that I (Ortom) am joking with them (Fulani), but my response when my wife told me this, is that am not joking, this law has come to stay. “I challenge anyone who has superior solution to the senseless killings of our people other than anti-open grazing law should bring it forward, before the passage of the bill by House of Assembly, due process was followed, every nationality living in the state; the Igbos, Yorubas, Hausas/Fulanis and others were invited to the public hearing. He added that attacks on farmers by Fulani herdsmen necessitated the encatment of the law.